Austin, TX – August 31, 2017 – No one saw it coming – especially those managing inventory at Amazon. 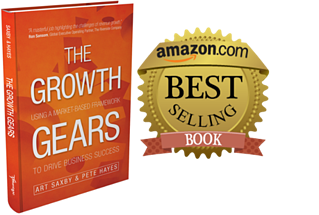 Yes, The Growth Gears™, a top selling book for senior business executives, became “Temporarily Out-of-Stock” yesterday at the world’s largest online retailer. Published in February 2016, the 224-page book by Chief Outsiders principals Art Saxby and Pete Hayes, has already been through a second press. And the third printing is underway. But apparently not in time. What’s behind the surge in buying? Professor Leigh McAlister at The University of Texas, McCombs School of Business says, “I think that The Growth Gears is a demonstrably superior way to teach marketing…Believe it or not, textbooks never claim a link between marketing and growth. Second, though textbooks talk about insight, strategy, execution, they never emphasize the importance of having the three coordinated—that marketing’s ‘magic’ doesn’t work unless the steps are taken in the right order and with tight coordination.” Professor McAlister has been promoting the book to her colleagues across the country, and it appears that in addition to classes at her campus, other universities have adopted as well. Patti Boysen, president of publishing at Advantage Media Group, has confirmed inventory will be replenished quickly, and that students (and business executives) should keep ordering. 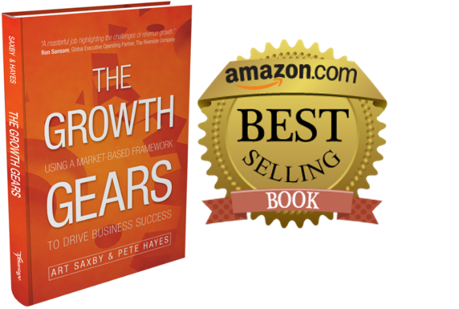 Published in February of 2016, The Growth Gears: Using a Market-based Framework to Drive Success, has quickly become a best-seller for leaders of growth and mid-sized companies who find themselves too focused on running their businesses to grow them. The book provides a simple framework as well as tools and action steps for identifying and adding these “gears” to give companies a set of repeatable behaviors and processes to fully capitalize on market potential. Pete and Art bring their decades of executive marketing experience, and their years of building a top national management consulting firm, to lead readers from insight to strategy to execution.